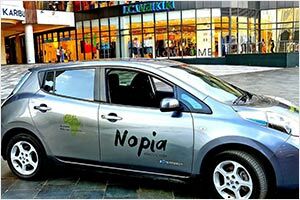 EkoRent Africa, an electric mobility company has launched a full electric vehicle service called Nopia Ride in Nairob,i Kenya earlier this month. "We have now launched our zero-emission electric transportation service pilot in Nairobi. We aim to increase our fleet size to around couple of hundred vehicles by the end of the year," the company says calling on Kenyans to register either to ride or drive. The venture was flagged off by Dr Kepha Ombacho, Head of Public Health at the Two Rivers Mall in the country’s capital. He praised the company for their thought full and timely move to conserve the surrounding health and environment. “We care about the environment. Therefore, all our Nopia vehicles are non-polluting electric cars. By choosing Nopia, you help to reduce harmful emissions and to improve the air quality around you,” the company further adds. The cars are 100% electric, making them much cheaper to operate; hence reducing the travel cost as compared to gasoline or fuel operated vehicles. The Company will have charging bays all around Nairobi. They will employ the same book a ride and pay formula. Payment can be made through M –Pesa , minimizing the use of cash and making the service digitally friendly. Riders can download the Nopia app to avail the service. Since it’s the first fully electric ride service in East Africa, it is counted as an inspiration for African progress. Nopia is a product of Finnish company EkoRent. Founded in 2014, the company has its headquarters in Helsinkin, Finland.